On an early summer solstice morning, June 2018 on the way to climb a remote nub in the Funeral Mountains a detour is taken up the north knife ridge of The Hole in the Wall when it appears that a steep scramble would allow access. The remote nub will have to wait as the ridge line was too much fun to pass up. 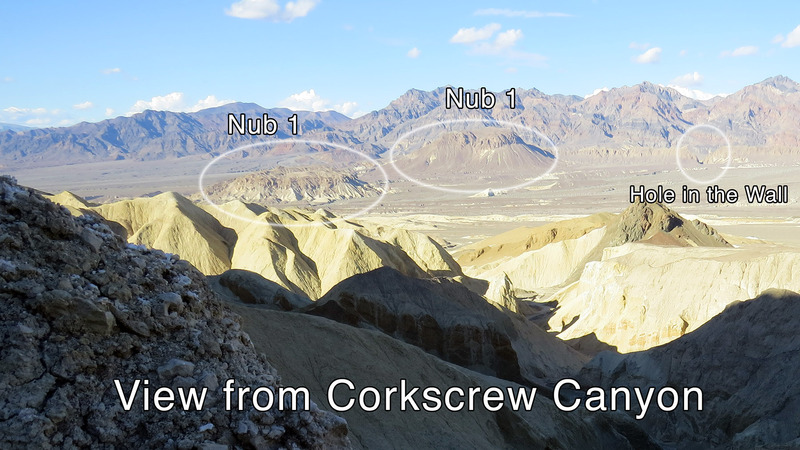 I have always wanted to explore the two large nubs north of Highway 190 between Navel Spring the Funeral Mountains. On my last trip to DV and the last morning, I drove up to the base of Hole in the Wall to climb the larger nub and farthest north. While crossing the base of the north ridge of Hole in the Wall heading for the nub I glanced over and saw what looked like a possible scramble route up the intriguing west face of the ridge. The geology and contours of this ridge became more seductive and as it appeared that the nub was farther away with an access that was not readily visible. I had been to Hole in the Wall once before and knew how steep the east side of the ridge was so It had never even occurred to me to climb the ridge for a peer down into the Hole from above. Here's the video of my most enjoyable "Off the Wall at Hole in the Wall" detour. Misc: While on top peering down into the Hole I could clearly hear the pleasant sounds of young raptors in their nests crying to be fed but try as I could and even zooming around with my camera into the numerous crags and holes on the south ridgeline and west face I was unable to locate the nests. Frustrating but fun. Due to the summer heat, I had the entire area to myself and the quiet was bliss. I made my retreat before the heat hit a 100 degrees after making most of the scramble in the shade. I still plan on topping the two nubs sometime soon. The larger nub in your photo isn't particularly difficult to ascend, but the rock is sharp and loose so gloves are a necessity. I climbed it many years ago, and the best route seems to be the crack visible in the center of your photo. If you find another route to the top, I'd be interested to hear about it. I haven't been to the top of the smaller one yet. I climbed it many years ago, and the best route seems to be the crack visible in the center of your photo. If you find another route to the top, I'd be interested to hear about it. I haven't been to the top of the smaller one yet. Hey Kauri, so glad you've scrambled up this nub before. The route you described is the one that appeared to be the best from my angle of approach until I got distracted by the Hole in the Wall west face. If you have a trip report on that nub, I'd love to see it. but the link to his report no longer works, and I understand he's dropped off the forum. So, if you do that hike, your report might then be the only available report on the larger nub. And no worries if you get to the top of the smaller nub before I do---to my disappointment, I won't be able to get back to DV for at least another 5 months.